So, yesterday was the first time I took Triskelion out in public. Up until now, all my sales – both yarn and batts – have been on Etsy, through guilds or sold to friends, so it was good to really get the show on the road and meet my customers face-to-face. And it was great. Actually, it was pretty damn fantastic. Firstly, it was a wonderful opportunity for me. I’m pretty much an unknown outside my little backwater of the internet, and for Brenda Dayne and Amy Singer (the organisers and hosts of P3) to take a risk on an unknown was very generous. Plus, that they also picked two small yarn and fibre vendors – Triskelion and Squeaky Elliot (more on Estelle and Mark later) – local to the venue deserves recognition. We need support and patronage in West Wales, and they did us proud. So, yeah, I’m pretty grateful for that, and I’m really pleased and proud that their risk paid off. I sold the majority of the yarns I took with me, and all of the fibre batts. Given I had no idea of what to expect in terms of sales, I would’ve probably been pleased if I’d sold a quarter of what I’d taken. So, thanks are also due to the knitters and spinners who liked my products enough to spend a good deal of money on them. One knitter literally left my table with her arms full – eight skeins of yarn and three batts. Thank you. 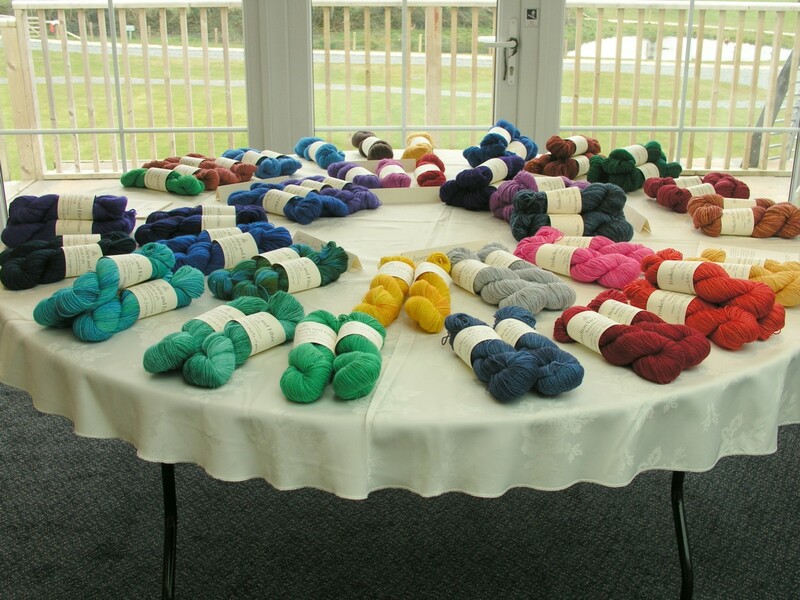 I got loads of excellent feedback, both on the yarn bases and my colour range. Lots of stuff to think about, much of it corroborating my own thoughts about future directions. Again, many thanks for everyone’s feedback and thoughts. Sophie Durlacher of Twist Yarns deserves a special shout-out, as does Brenda herself. It was also great to meet US folk who I know from Facebook, but never met. It was particularly good to meet Betty Hoffmann – such a shame I couldn’t spend more time with everyone, but the day was a whirl for me, let alone the retreat folk. And then Squeaky Elliot. What can I say? Estelle and Mark made the day that much brighter. Great fun, full of life, and really proud of their products – and justifiably so. Really, go check out Estelle’s Etsy shop and fill your boots. Their Gower wool line – from sheep owned by Mark’s family – is the most gloriously squishy, characterful, soft BFL blended with Black Welsh Mountain. And the most beautifully dyed heavy laceweight linen yard in softly intense colours… I couldn’t keep my hands off it, and kept going back to leer. We settled on a trade in the end, and Estelle had some of my yarn, and I came home with four skeins of Bubblegum. I’m not sure whether to go for a knitted shawl or a woven one, but for now I’m just going to gaze at it sitting on my desk. Thanks, Estelle and Mark, for really being the cherry on the cake of the day. A great day for me and Triskelion, topped by the website going live. We’ve made a great start to the year. And thank you for taking part, the market place is a much looked forward to part of P3 and no one was disappointed by the wonderful colours and yarns on offer! Thank you so much for participating in the market, I truly love my purchases. How is the jellyfish doing? You have to give it a name!! !